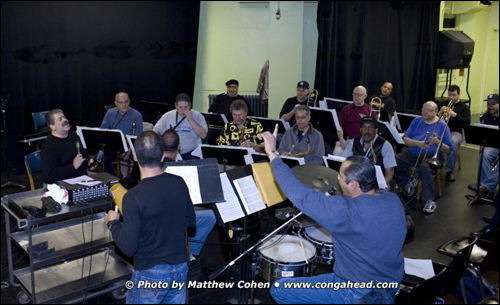 On January 9, 2007 I visited Boys Harbor in NYC to hear the rehearsal of the Latin Jazz Giants. This band featuring 5 saxes, 4 trumpets and 4 trombones led by timbale player and arranger, José Madera. Joining José were Johnny "Dandy" Rodriguez on bongo and George Delgado on conga. Alto sax player, Stu Jackson is promoting and financing the band with hopes of bringing this amazing music to a wider audience.